It�s quite interesting at times when things in a certain sphere just all come together at one time. That certainly seemed to be the case over the past ten days as they lead up to the USPMGA Master�s happening this weekend in Myrtle Beach. 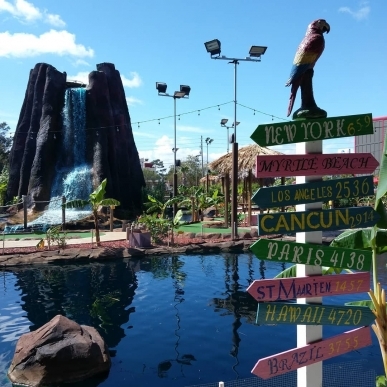 This past week work found me right in the heart of minigolf country in Orlando, Florida. I wasn�t sure if I would have time to sneak away for some putting but after a team event, 6 of us headed to Pirate�s Cove on International Drive. I never seem to have a problem getting people to come with me since at this point several of the people I work with are always looking for their chance to beat me straight up on a course. Upon arriving, one of my co-workers felt the need to point out they were there to take down a pro-minigolfer. I�m not one to usually announce what I do when I�m at a course (especially when reviewing for The Putting Penguin) but sometimes people figure it out from a shirt or hat. This time, however, the clerks seemed dubious as to the �pro� nature of minigolfing. Well it just so happened I was wearing a hat from a USPMGA U.S. Open and between that and the business card I produced for Minigolfnews.com, they were convinced. So much so that I ended up with a free round and my friend�s go discounts � an unexpected perk! I started the round great, with an ace, and I felt like I was going to be on my game that night (even after a few adult beverages at the prior event). Things quickly tightened up though and through 16 holes I was on the verge of losing my title. However, the skill of consistent play came through at the end as my closest competitors carded a 5 and a 4 on the last two holes for me to eek out the win by a stroke, continuing my reign as undefeated KPMG champion in first round play. I took that as a good sign headed into tournament play soon. During the week, the casting call for Mega Mini Golf was also made public (there�s still time to enter!). I was aware of the show about a month ago when the production company had reached out looking for some information on minigolf worldwide and I started talking to a gentleman there about my minigolf experiences. By that Friday I was on the phone with a casting agent who not only recognized The Putting Penguin but was happy to be talking to one of the two main penguins. I was a bit reluctant to try to be a contestant on the show, as reality television isn�t really my thing or something that meshes with my more introverted personality. However, after a chat with Randy Rice (who�s been on television before), he convinced me that being involved with it would be nothing but good for the sport on many levels and I couldn�t argue with that line of reasoning. I always want the best for the sport and if there�s a way to promote it to a wider audience (this show will be on ABC, so that�s a pretty wide audience) then I was up for the task. As of the time of this writing I�m scheduled to do an in-person follow up interview with the casting folks on Saturday after the tournament so we�ll see how that goes! All this is just a preamble to the real reason I�m writing a post � it�s the eve of the Master�s! This actually would have been the first day of the tournament but a call was made by a committee of players to postpone day 1 due to the impending tropical storm Michael that was forecast to roll through the area. This means we will just play Friday (4 rounds on both Aloha and Rumble) and Saturday (3 rounds on Rumble, totaling 11, one shorter than usual). I think that will make for a more interesting tournament as it cuts one round from the �easier� course and the course which it�s possible to go low and really open up a few stroke lead. I suspect this will bunch up the scores even more than normal over the 12 rounds. More importantly, I think it was a great decision by the USPMGA to involve a group of experienced players in coming up with a decision ahead of time, one that saved as much of the tournament as possible and took into consideration the players health and safety. While the rain didn�t pan out, the 30-40 MPH winds are whipping and I�m glad to not be playing right now. As for me, I took two days with the family to drive down to Myrtle Beach from Connecticut (about 13 hours of driving in total) and hit the course on Monday, meeting up with my buddy Mark �The Highlighter� Novicki. For most of this week we�d not only practice together but we�d dine several dinners at the condo my family was renting together and (as of the time of this writing) would play another 4 miniature golf courses in addition to the Master�s two (always more stuff for the website!). It�s fitting that we�d hang out so much together since we decided that we�d enter the doubles tournament for the first time this year. I don�t have expectations of winning given some of the names who double up in that division but we�re looking to make a go of it and figure we can start to work our way up in those standings too. Watch out for team Highlighted Penguin in the future. I feel like the three days of practice I had were the same as always � some good putts, some stupid putts, some good scores, some ones to look away from and overall I feel like I�ve gotten as far as I can with understanding the courses before the tournament. The one highlight (no pun intended) of my rounds was a 27 on Aloha, the first time I�ve broken 30 on that course and it came with one bogey so I was feeling good about my putting there. What I�ve come to notice from recent tournaments is that I may not feel like I�m shooting lights out in practice but all that repetition and work does pay off when the money starts to be on the line. For the most part I�m keeping the same shots as last year, with a little bit of tweaking on a couple of holes based on how I�m hitting the ball. I also had a chance to learn a bit from current hot putter Rainey Statum over at the Rumble on hole 10 and might just turn to his shot come tournament time. It was so nice of him to take a few minutes to show me the shot, explaining why he thinks it works and watch me take a couple of cracks at it (I would use it to ace that hole later in the day). I can�t praise enough the cooperative aspect of the players in our sport and the willingness to show what is working for them. Everyone on tour is always willing to share a bit of �where do you line up?� and �where are you aiming?� with anyone who asks and I hope that players new to our tournament find that it helps bring them into the fold. Even the general public who were on the course for some of the practice days got a little of our wisdom as we tried to help them conquer the courses. I think my favorite part of the week, though, has been when Mark and I have gone to the other courses. Almost always we�ve run into other groups playing (we play kind of quick as you can imagine) and have gotten to answer the �are you guys pros?� question seriously, and often times with an ace or two while they watch us go through. I like to think we made a bit of an impression on the folks we�ve seen and who knows, maybe they will come out to watch the pros at it in the tournament. This year, there was a bit of a format change and we did the opening ceremony on Wednesday night in conjunction with the First Tee charity event held at Aloha, where some of the pros pair up with juniors to support the charity. The idea was to get through the formalities then so we can get right to putting on the first day (and this was arranged before Thursday was cut), which I think is a good way to make sure things get rolling quickly. The only point of improvement I have so far is consistent with past years and other USPMGA events I�ve attended. I think the �players meeting� needs to be longer and more comprehensively go through the rules for the tournament and both courses. There was a couple of items discussed in this meeting but some of it came across as back and forth with players in the audience and not everyone can hear. More importantly all of the rules and the logistics were not properly discussed (like what the �cut� line is to play Saturday afternoon, how scoring will be done, etc). Once again, having run a few tournaments myself, I know people like to hear everything to be comfortable when playing, even the �seasoned� vets. Even if the vets don�t want to waste the time, the important part is to make new people comfortable since we want to continue to grow the sport. My suggestion would be to have one of the players run the meeting and take the time to discuss everything. I�m willing to do it if no one else wants to. Also, it seems again that some rules have been put in place last minute (how to move the ball off the rock at Rumble 17), or not communicated well prior, meaning that players haven�t had a ton of time to practice properly with them. Also, I know Bob likes not having a stroke limit because it�s more like the PGA, but the USPMGA is a member of the WMF and the WMF DOES have a stroke limit (mark 7) and we should adhere to that in this tournament. For the top players it shouldn�t make a lick of difference but it does help to make sure play continues at a good place for individuals of all levels (especially since we want as many people as a possible to play the tournament). It�s now time for predictions and odds. This is a heck of a tournament to try to handicap because there are so many good players that I don�t get to see often, so I will start with my personal goals/predictions. I will be starting over at Aloha, so it will be key to get off to a good start on that course. 1)	I want to finish in the Top 40, which would put me in the top half of the players and a few spots ahead of my finish last year. I think I can do it. 2)	Last year I shot a 409 for the 12 rounds. Take out a 34 for a round at Aloha and I�d be looking at 375. So my goal this year is to be under 370 which I think I can do, with a stretch goal of being under 360. 3)	I will break 30 at Aloha. 4)	I will ace at least one hole at Rumble 5 of the 7 rounds I will play there. 1)	The leader after day 1 will not win the tournament. I think the change in format will make for more movement on Saturday than in the past. 2)	I�d put Rainey as my favorite right now given his recent success but only at a 4-1 payout. Too many other great putters and past champions to put him too far a lead horse in the field. Olivia, Ricard, Greg Newport, Randy Reeves, any of the McCaslins, and really any of Team USA I would consider on the board for odds. I think the field presents a lot of strong choices too, so if you exclude everyone I just mentioned, I think the field bet may be as low as 15-1. 3)	I also think we�ll have a new winner this year (which Rainey fits). It will all be decided starting tomorrow morning at 8am. You can follow along with the live round scores here. Check back after the tournament for a wrap-up blog! I enjoyed reading your blog. Handmadewriting is a professional essay writing service that will help you get a good evaluation on any subject. I enjoyed reading your blog. https://handmadewriting.com/ is a professional essay writing service that will help you get a good evaluation on any subject. My self and all my friends from my tennis club have been going here for over 2 years ... mega Mini Golf , responded to this ... unexpected and thought maybe more snack food as by a mini. Thanks! I'm doing my best to peel away what playing in tournaments is like and just promote minigolf overall as a sport and pastime. Hoping it motivates some more people to join a tournament at some point. I enjoyed reading your blog. You make some excellent points.